It has been over 12 weeks by now since we arrived in Manila. Although my family has been exposed to a number of cross-cultural encounters in past, another one doesn’t just get easier! Extremely hot and humid tropical monsoon conditions quickly wear us out. The world’s worst traffic jam in the metro Manila frustrates our in-and-outs. We had a hard time to survive without an air conditioner or a fan in the beginning. To make the matter worse, a water pipe in our neighborhood lately burst due to ongoing heat to leave our house with no water for the last couple of days. Nevertheless, we’re slowly adjusting, and the Lord has been truly gracious to us all along. Timothy and Titus have entered the Faith Academy, one of the oldest MK schools in the world, as transfer students in the 10th and 6th grades. As Eunice and I began full-time teaching ministry here at the International Graduate School of Leadership since May, we’ve been often privileged to witness passion of IGSL students for the Lord and effective ministry. 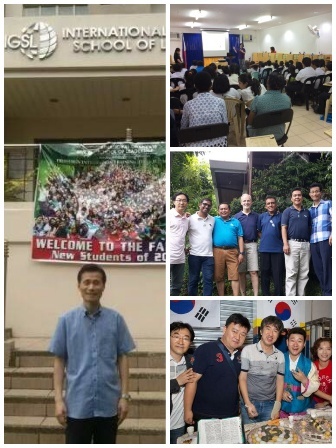 The students are from nearly 20 nations of Asia and elsewhere, many of which gospel is either extremely hindered or restricted to access. Most of them came to study from the countries with less than 10% evangelization rates! This is what initially captured our hearts and continuously motivates us to serve here in Manila in spite of challenges we may face. One of Bangladeshi students in our mentoring group lost a friend by the recent terrorist invasion at a trendy restaurant in Dhaka. 20 non-Muslims were brutally murdered if the victims could not quote certain Quran verses. Some of his Christian colleagues are under 24-hour police protection due to constant threats of violence. A substantial number of IGSL students would go back after graduation to such hostile places to witness Christ. Within 2-3 years of time while they’re pursuing MA to PhD here, we’re determined to invest our time and energy to help mold in them Christ-like characters and virtues. This is one critical but meaningful task! And we’ll need your prayer and support to do so. Our teaching ministry at IGSL is purely based on support-raising. We do not get paid nor any of the professors at IGSL do so. We all serve as volunteer professors so that more students may get benefits of scholarship made available for them. Over 80% of IGSL students are studying with full or partial scholarship, and it takes thousands of dollars to educate one graduate student for 2-3 years. We do appreciate your prayers and support. And if you have a heart to reach Asia and Africa and are looking for ministry to support, would you kindly consider this ministry? We trust your seeds will not go wasted at all as you sow into the lives of these elite soul-winners and church planters.